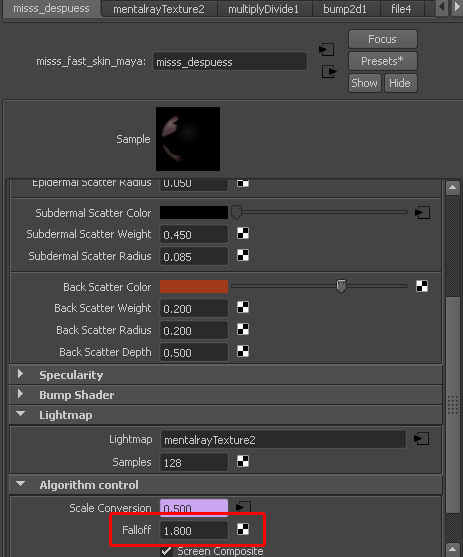 Question: I was wondering if you shed some light on the falloff parameter of the MISSS_Fast_skin shader in maya 2012, I couldnt find any documentation on this parameter, and wondering if its scene scale / rig scale dependent? Answer: No, falloff isn’t scale dependent. It is really just a “shaping” of the filter kernel. Imagine the blurring-filter for light has weight 1 at the center and 0 at the scattering radius and if it was linear between the two it would basically be a triangle filter? Except that triangle is raised to the power of “falloff” allowing you to play with the “shape” of it. Thank you master Zap, hope this helps someone searching for the same thing online, as I couldn’t find any online documentation on it.